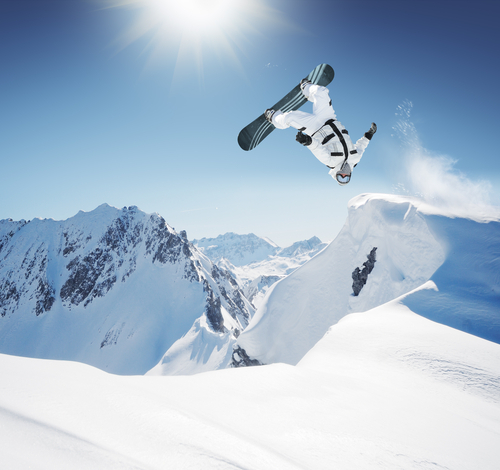 Even if you’re not interested in snowmobiling or snowboarding, you will appreciate the excitement of winter extreme sport athlete Levi LaVallee. Red Bull had the same thought when they became his sponsor. Having sports icons represent a brand is an old school idea—seeing as it goes as far back as Coca Cola featuring the Pittsburgh Steelers’ Mean Joe Green throw a game jersey to a kid in a commercial. However, Red Bull has taken it much further. You’ll see a Red Bull logo here and there on LaVallee as he flips through the air, but that’s not what Red Bull necessarily wants you to focus on. Instead, the energy drink company wants you to focus on who this athlete is and what he’s about. The company’s initiative is to tell consumers interesting stories about famous athletes or other people they can connect with. This new kind of branding is more savvy and even more personable than Mean Joe Green’s Coke commercial. Instead of shouting, “BUY THIS PRODUCT,” it is campaigning an idea or showcasing talented people whom other people admire. Through Facebook, Twitter, Instagram and other social media platforms, companies like Red Bull are generating quality interaction with their consumers. Perhaps the grandest action sports publicity stunt of all-time and high IQ business campaign was the Red Bull Stratos supersonic freefall by Felix Baumgartner that broke the sound barrier while over eight million watched live via the online broadcast at the RedBull.com website. It resulted in incredible branding exposure for partners and supporters and nearly $50 million in projected marketing revenue value to their brand. In addition, studies show that when sports fans see a brand message on a social media platform, 78 percent of them view that brand in a positive manner, claims Navigation Research. With the use of videos, blogs and social media updates, what is known as a social by design digital marketing scheme can help a company like Red Bull expand their consumer base and reinforce the quality of their own brand in association with the sports, athletes and fans they are sponsoring. Much like Red Bull, GoPro has done well in the social by design scheme. The wearable camera company’s P.R., however, has made GoPro the golden standard in getting consumers to work for them. GoPro’s genius campaign included holding a video contest. This not only got consumers interested in buying and using their product, it got them to use it in unique ways and showcase the products to others. Videos ranged from sky divers to surfers to skaters to base jumpers, all of which provided viewers with action-packed and exciting videos. These viewers, in turn, shared the videos with their own networks through social media, and thus created a snowball effect. However, GoPro didn’t just hold a contest to which consumers came flooding in. Yes Media Works explains that the lesson they learned from GoPro was to use video contests in creative ways. If your product is naturally exciting, then simply set up a contest through social media with a great prize and let consumers go crazy, they explain. Or, if your product is more subdued, then ask contestants to make videos using the products in unique or unexpected ways. For example, YooperSteez, a T-shirt company in the Upper Peninsula in Michigan, held a contest by campaigning a photo contest with people wearing their products. Its Facebook fans received daily updates and were directed to the YooperSteez website to vote, which generated tons of web site hits and great social media shares through their own customers. Both Red Bull and GoPro used their target market and products to their advantage. Action sports was a great fit for both brands and helped show other companies how they can be creative with their marketing. Now, all that’s left to see is what they will do next. 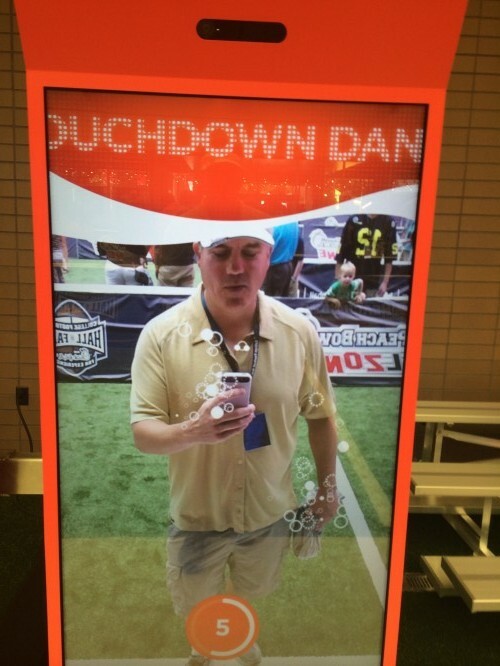 College Football Hall of Fame Coca-Cola Touchdown Dance Machine inside The Playing Field exhibit @THESportsTechie selfie. Sports Techie, The branding respect I have for Red Bull and GoPro is beyond measure. I also feel a bond with small business owners who understand how to create brand awareness and guerilla marketing success since I have been doing that for decades for other companies such as Dartfish, and now mine as you can see via the selfie photo above captured with an Apple iPhone smartphone. The Sports Techie community blog is a combination of these marketing elements and more. The new College Football Hall of Fame here in Atlanta has a ton of happy sponsors including Coca-Cola. Coke installed a fun, engaging and interactive tech Dance Machine on the CFBHall first floor inside The Playing Field exhibit. I felt this was an action sport area because of the playful Chick-fil-A Peach Bowl Skill Zone and Touchstone Tunnel Presented by Southwest Airlines. I am a subscriber to The Red Bulletin magazine via a free Klout perk and often visualize a Sports Techie type print and online magazine that has the same kind of lo0k and feel but is loaded with more sports technology information, and our brand specific topics such as robotics, gaming and sustainability throughout the pages. GoPro is owned by Disney who also owns ABC and ESPN. They recently had a successful IPO stock offering. Hats off to their smart founder because he quickly produced action cam technology before it become a saturated Industry as it is now is with strong competition from other US and overseas sport and activity cam manufactures such as iON and others similar camera related product companies. At the end of the day, branding tools such as brand awareness and guerilla marketing are in the eyes of the beholder because of focused execution by wise sportsbiz people who make it feel as natural as athletes performing amazing action sports.